Culbert Olson being sworn in as governor, with his left hand in his pocket, rather than on the Bible. Photo courtesy of Deborah Olsen. He may be best known for refusing to say the words “so help me God,” substituting it with “I will affirm” as he took the governor’s oath of office. But he was much more than that. He was a progressive who was far ahead of his time, perhaps too far for his own good. I believe now would be a very good time for a reappraisal and deeper understanding of Governor Olson. I say that not merely because Culbert was my grandfather. He proved prescient about the threats to American society—from economic inequality, war, racism, and the dangers of religious tribalism—that are all too much with us today. Olson was born and raised in Utah in the Mormon faith but left the church as a young man after deciding that Joseph Smith was an imposter and that his revelations didn’t make any rational sense. He came to atheism after listening to lectures of one of the most famous American atheists, Robert Green Ingersoll. No governor has faced so many obstacles in pursuing his ideas. The California legislature and political establishment dominated by Republicans, and William Randolph Hearst’s right-wing newspapers, opposed almost all of his progressive initiatives and the laws he proposed. Olson didn’t trust large corporations, especially financially powerful interests. He wanted to support the mainstream American middle class with his progressive ideas. But the legislature defeated most of his programs, which included support for solving the devastating unemployment crisis with the “production for use” concept championed by Upton Sinclair; public ownership of public utilities; universal health insurance for every Californian; legislation to raise taxes on upper-income banks and corporations; and new regulations on lobbyists. He was successful in breaking up big oil, regulating “loan sharks,” and rewriting usury laws, reforming the largest and most oppressive penal system in the United States at the time, and writing laws to support labor unions. He proved prescient about the threats to American society—from economic inequality, war, racism, and the dangers of religious tribalism—that are all too much with us today. Eventually, Governor Olson had to accept the internment after a military order from General John DeWitt, a fervent advocate of incarcerating Japanese Americans. In 1943 he lost his re-election bid to Earl Warren due to the improved economy in California preparing for World War II. In an ironic twist, Warren proved more effective than Olson had been at pushing through some progressive aspects of Olson’s program, including corporate regulation, political reform, and investment in public infrastructure. After he left office, my grandfather became President of the United Secularists of America, a body of secularists, atheists, and freethinkers. This work included defending separation of church and state, eliminating superstition, promoting taxation of church property, and opposing religion in public schools. 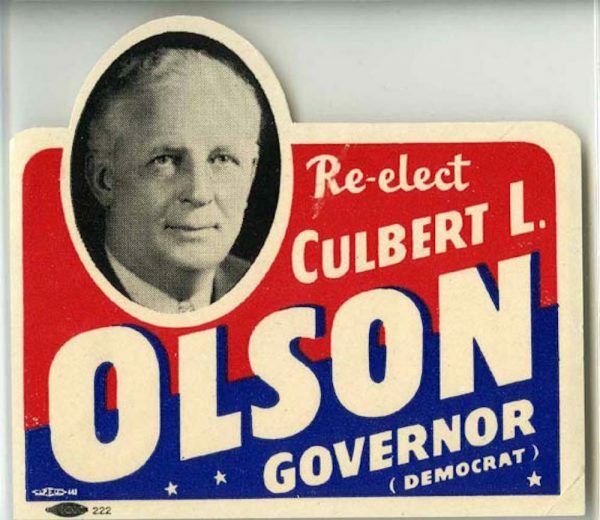 Governor Culbert Olson represented an American tradition of politics that originates from basic human needs and not from personal or financial privilege. His message deserves more thought and attention today. Debra Deane Olson is a longtime peace and environmental activist and the founder of Peace Solutions. She enjoys spending time with her daughters and grandchildren.